USARK wishes everyone a happy New Year's Day and a great start to your 2014. We would like to thank a few people who made it possible for USARK and our fight against overreaching legislation and anti-pet groups to continue in 2013. Ty Park from Ty's Lizards is a Platinum level member ($1,000/month) of USARK. Ty is extremely generous, supporting many conservation efforts and the herp community, while specializing in captive reproduction of rare species of lizards and securing their populations. The World Pet Association recognizes the significant role of USARK in the pet community and donated $10,000 to aid our efforts. Bob Ashley and Brian Potter from NARBC raised $50,000 for USARK through their show auctions, thanks to the donations from breeders and herpers. Wayne Hill supported an auction at the Daytona NRBE that raised $20,000 for USARK. Customers of ShipYourReptiles.com who have continually donated through the SYR micro-donation program. Thank you to all these great contributors and others for your support. Since the announcement of our battle on the national front concerning the listing of snakes as injurious under the Lacey Act, the herp community has responded. Though this currentfight concerns constricting snake species, the entire herp community recognizes the need for everyone to step up as this affects us all. Gecko breeders, turtle/tortoise breeders, ball python breeders, big snake keepers, frog breeders, food suppliers, dry good manufacturers and all other corners of our community have donated. Support from other pet communities, including dog, cat and bird, is also incoming. They realize the larger battle concerns anti-pet and special interest groups trying to end pet ownership in America. Last week, the USARK Reptile Defense Fund had collected $75,000. That total is comprised from funds raised in the Reptile And Amphibian Charity Auctions and donations from The Reptile Report, ShipYourReptiles, Ralph Davis Reptiles, Michael Cole of Ballroom Pythons South and other contributors to the Reptile Defense Fund. 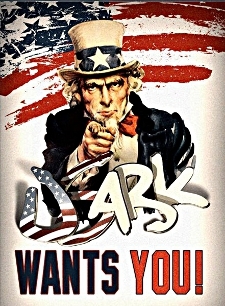 More funding from commitments is coming soon from many sources.We owe special thanks to many people for making this possible, taking active roles and helping to improve USARK. A few notables include: Russ Gurley of TTPG, Brian Potter of NARBC and the Chicago Reptile House, Kevin McCurley of NERD, Kristopher Brown of Vital Exotics, Myke Clarkson and Jordan Russell of Reptile And Amphibian Charity Auctions, Ken Foose of Exotic Pets Las Vegas, Brandon Fowler of Roaming Reptiles and the members of the USARK Board of Directors, many of whom have donated heavily to the Reptile Defense Fund. You can also double your donation thanks to Bob Clark Reptiles. Bob is matching $5,000 in donations. Simply write "Clark Matching Donation" when contributing to the Reptile Defense Fund at www.usark.org/reptile-defense-fund-2/. Thanks, Bob! All donations are automatically posted on the Reptile Defense Fund Donor Wall at www.usark.org/usark-announcement/reptile-defense-donor-wall/. Thank you to everyone that has donated which allows us to stop this attack upon our community. "We will be hosting another USARK Facebook Fundraiser in January! Auctions will kick off on Wednesday, January 18th, and conclude Sunday, January 22nd. Please Private message: Jordan Russell or Myke Clarkson on Facebook. Alternatively, you can email donations to: Jordan Russell (CaliforniaBreedersUnion@gmail.com). Additional details and donation form can be found at the Reptile And Amphibian Charity Auctions page (https://www.facebook.com/groups/RAACAUCTIONS/). Thank you Jordan, Myke, ShipYourReptiles and everyone else involved. You make this fight possible! We will have additional details soon of our legal strategy and how members of the herp and pet communities can directly contribute. We appreciate the passion and dedication from our fellow herpers as USARK has committed to stop the overreaching legislation being forced upon the herp community. Read our previous press release at www.usark.org/2013-blog/usark_takes_action/. Reptile Super Show: January 4-5, 2014 in Pomona, CA. This will be the largest and best Reptile Super Show as it takes over an even bigger venue. Be sure to attend the USARK benefit auction on Saturday night following the reptile show at the Sheraton Fairplex host hotel. We already have many great donations, with many more to come, and the family-friendly event is free to everyone. This auction will support USARK, with special segments to support other worthy causes. Get details at http://reptilesupershow.com/los-angeles/. 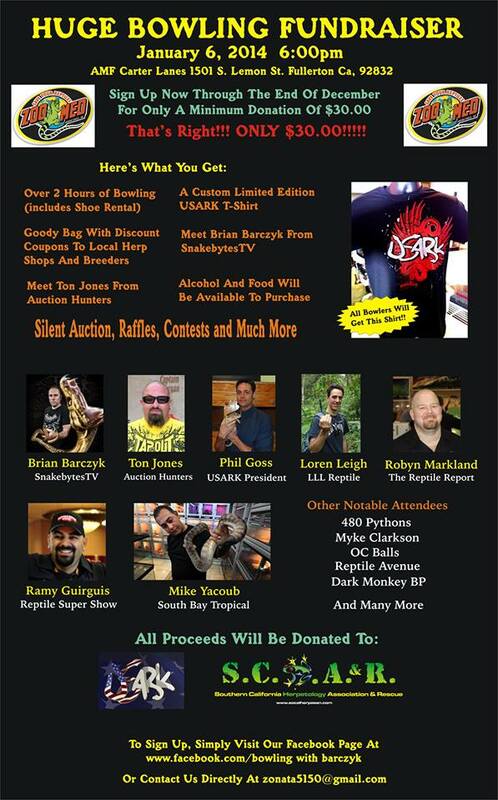 Bowling with Barczyk: Attend a bowling fundraiser featuring Brian Barczyk (BHB Reptiles and Snakebytes.tv), Ton Jones (Auction Hunters), Loren Leigh (LLLReptile and Supply), Robyn Markland (The Reptile Report/ShipYourReptiles.com) and other industry notables. Tickets are available now and spots are limited. Proceeds will be split between the Southern California Herp Association and Rescue (SCHA&R) and USARK. The event will be held on Monday, January 6, 2014 (the Monday following the Reptile Super Show) in Fullerton, CA. Tickets must be purchased in advance. Get more details at https://www.facebook.com/bowlingwithbarczyk. National Reptile & Amphibian Advisory Council (NRAAC) Law Symposium: March 7-9, 2014 in Washington, D.C. Registration is free but limited to the first 200 registrants. The event will include three days of panels, workshops, breakout sessions and talks with the goal of bringing all parties interested in reptiles, amphibians and the law to the table. Discussion will be focused on changes and issues with current and proposed herp laws and regulations at the local, state, federal and international levels. Get the details at http://www.nraac.org/symposium2014.html. The crew at Ty's Lizards supporting the herp community in their USARK shirts: from left to right: Ben Faria, Anna Pham, Lindsay Pike, Corey Cooley, Stephen Taylor, Matthew Gramz, Chris Tennant, Brittany Kuchcicki, Kurt Doudt, Peggy Dontuono and Wayne King. Missing is Kathy Doster. Click the image to visit the Reptile And Amphibian Charity Auctions page. Thanks Myke and Jordan!